Content is king, but design deserves some time in the spotlight, right? In fact, design IS the spotlight that makes our content shine and be seen. Whether branding your business, designing assets to distribute and amplify content, or creating an exciting large piece of content, it takes team collaboration to make it great. So, we went right to the source to get some advice on marketers working with creative teams. Joseph Kalinowski– JK to our #CMWorld community – and creative director here at the Content Marketing Institute, was our special guest for the day. 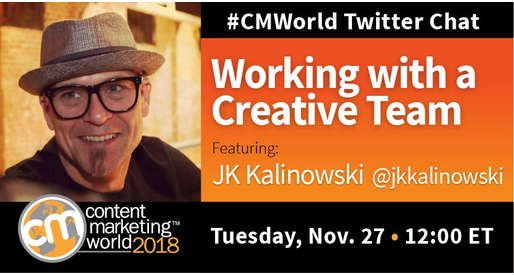 We had a fun-filled #CMWorld Twitter chat with JK, as he and many members of our community were well-versed in the creative process, working with creative teams, and even how to prepare creative briefs that prove useful to all team members involved in the process. The two questions below struck up some great conversations. For more tweets and responses from the discussion, check out our Twitter Moment. In what part of the content marketing process should marketers get designers involved? What is the best way for a marketer to present a new project to a designer? A3: As early as possible. I’ve sen great design when the designer has had enough time to process the content. And if we bring them in during the brainstorming process, they can even influence content ideas. What do designers wish marketers would better understand? Conversely, what do marketers wish designers knew? What are some tips you have to work with your creative and design teams? Do you have fun projects you can tell us about? Let us know in the comments below. Would you like to learn more from our community members aside from our Tuesday gatherings on Twitter? Join us at Content Marketing World 2019! Registration is opening next week on December 3, 2018. We hope to see you next September in Cleveland!